Gustaf and his brother Victor has a Nissan Skyline, trimmed up to 500hp and then throttled back to 360hp for handling and noise. 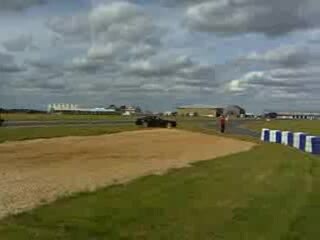 Me and Victor went to the UK, met up with Gustaf and we all went to the Bedford Autodrome. I didn't drive, so I eneded up being the official photographer of the day. Due to being close to a couple of villages, the Bedford Autodrome has the most stringent noise requirements of all tracks in the UK. It has four monitors set up around the track, and if nay of them is triggered, a signal goes off at the council and the autodrome operators have to phone up and explain why the monitor was triggered. 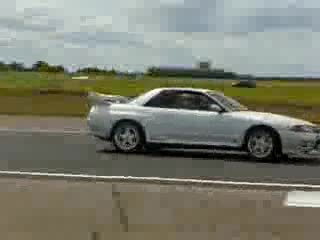 With a silencer the Skyline went from "a lot" to 98 dB at 4500 RPM (static). However, due to a gap between the silencer and the exhaust nozzle it was fitted into, we ended up with the only jet-powered car on the track. One guy skids off the track right into a gravel trap. Not just any trap, but the one in front of the area where everyone's cars were parked. This is what his Mustang sounded like when they had finally managed to drag the car out of it.